As the owner and executive chef at Sheild Catering and the Pig and Turnip in Springfield, Oregon, Sheild would know. After graduating college with a liberal arts degree in 2009, Sheild decided she wanted to explore a long-time love of cooking by opening her own catering business. Instead of going to culinary school or relocating to a major restaurant center such as New York or Paris, she stayed in Oregon. Job by job and skill by skill, Sheild consistently absorbed the trade and the building blocks of a successful food business: menu planning, customer service, managing staff, understanding sales and finances, and creating a solid business plan. The end result? Her consistency is paying off. Sheild started as a one-woman operation in 2014. After six months, her husband quit his full-time job to come on board to manage human resources and public relations. Today, Sheild owns and operates two separate yet companion businesses, with 12 full-time and part-time employees. After college, Sheild worked as a sorority chef and kitchen manager in nearby Corvallis. Her superior was an executive chef based in Eugene, and he gave Sheild autonomy and latitude to put her ideas and vision to work with minimal direct supervision. Sheild also saw more women in leadership roles in the industry. She realized that instead of cooking and managing for other people’s operations, she could start and run her own business. Inspired, Sheild began drafting a business plan. After years in the industry, Sheild left work for a while to have a baby. She kept sight of her business plan though, and by the time her son was two, Sheild was ready to go back to work—but this time for herself. Catering a friend’s wedding was Sheild’s first solo gig—it provided the capital to cover her startup costs. From there, she worked around her husband’s schedule and the needs of their son. Six months later, the catering business was at least breaking even, and starting to show small profits. Sheild’s husband, Joe, was now working with her. One day in 2015, Sheild was on Craigslist and found a cart for sale in Portland. “I said, ‘It’s my kitchen on wheels!’” It also meant bumping up her cart purchase time frame by four years. Instead of sticking strictly to catering focus and her business plan framework, Sheild contacted the owner immediately. It took four months to arrange financing for the $25,000 purchase. Sheild ultimately found funding through Community LendingWorks, an affiliate organization of NEDCO (Neighborhood Economic Development Corporation), an Oregon non-profit that helps people find safe and affordable housing, develop and maintain businesses, and revitalize neighborhoods. Along with her $7,000 down payment—drawing in part on credit cards—Sheild financed the remaining $18,000 through Community LendingWorks. Now in possession of her kitchen on wheels, Sheild concocted Pig and Turnip. It would offer German-inspired food: house-made sausages, schnitzels, fresh breads, and pretzels. Sheild hired someone to run the cart so she could focus on catering. After ups and downs with locations, a food cart space opened up at Sprout!, a business incubation, commercial kitchen, and public eating space in downtown Springfield, which is also where Sheild Catering leased its kitchen. 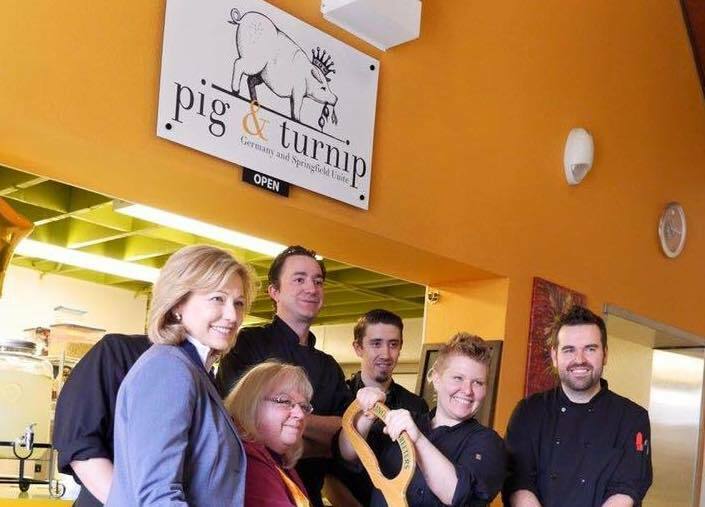 In February 2016, because the cart was seeing more success and the public was responding to Pig and Turnip’s food and brand, Sheild opened the Pig & Turnip Café at Sprout!. However, six months later an electrical problem put the food cart out of commission for eight months. “By then our business had exploded in both areas, so we have yet to get the food cart back out,” says Sheild. “At this point, it would need its own team.” Looking at her business plan, though, Sheild sees a role for the cart and wants to reopen it in 2018. Between the cart, the catering, and the café, the business has gone to plan—but it has grown faster than expected, as Sheild managed to pivot quickly to take advantage of opportunities. Now, in the midst of a busy 2017 wedding catering season, Sheild is balancing being on site for catering operations with stabilizing the business, streamlining operations, and ensuring healthy finances. Going back to that advice a CPA once gave her, Sheild’s focus is making sure that not only is the business successful, but viable and steady. With a dozen employees now on the payroll—including chefs, a café manager, a catering and sales manager, and three banquet managers and delivery teams who can be on-site at any time for catering operations—Sheild is also making sure she takes good care of her people. Managers now oversee day-to-day operations, and the catering manager handles sales, contracts, administrative tasks, client meetings, and customer satisfaction. That frees up Joe to manage a now-busier HR workload, as well as being the regular primary parent for their son Zeke, now four. Sheild can focus on updating the business plan, reviewing finances, revising and creating recipes, and managing the kitchen. To stay on top of her business’s day-to-day status and short-term direction, Sheild reviews income analyses, budgets, and the sales pipeline for both the café and the catering operation. Weekly meetings with individual managers, plus quarterly management team meetings provide a framework for discussing financial projections, staffing concerns, and ideas for further improving the business. In catering, their data and feedback are based more on each individual job, since they can serve a range of price points, clients, and types of events, from weddings to business functions. Most day-to-day data comes from the restaurant side, and Sheild is evaluating new systems that will provide better data. With the security of a four-year lease, Sheild also has the flexibility to move to a different location if needed, but she wouldn’t go far. “We want another fun, cool, restaurant in the downtown Springfield core, to keep that energy and momentum,” she explains. Eventually, there could be other locations, but expansion isn’t a priority right now. Do the hard work and focus on consistency. Find what works and support it with the right operations, logistics, staff, policies, and equipment. Write a business plan, expect it to change, and update it as part of your normal operations. Know how to scale if things take off. Businesses often plan to account for failure, but it’s important to plan for success too. Think strategically. Combined catering and restaurant operations can offset a commercial kitchen’s high costs, and mutually support each other as marketing and referral vehicles. People first, tools second. Bring on good people and work with their strengths so that both they and the business can excel. Then upgrade or add equipment. Have a mentor. They provide advice, accountability, and motivation.